What will your Easter Weekend be like? Do you have plans? Are you busy and stressed or relaxed and chill? In both cases, it’s easy to miss out on something more, something beyond ourselves. Easter is a great opportunity to remember that God has reached out to us in a most significant way… through his Son Jesus, the Christ. Easter is a time to remember the Last Supper, remember the Cross, and remember the Resurrection! There’s even an opportunity to fast (abstain from solid food) from Thursday dinner and Friday breakfast. Check out the link below in “Worship Service Information”. Let’s make this a most meaningful Easter! For Easter Weekend, we have four services with no Encounter Service at 9 am. Maundy Thursday (7:30 pm) is dark, quiet, and reflective with Communion and Tenebrae. Good Friday (10 am) is warm, contemporary and full of gratitude; with Messy Church for kids, and hot cross buns following. Easter Sunday Sunrise (7:30 am) is a chance to be with the first witnesses at the empty tomb (Markham Cenotaph–Hwy #7 and Main St Markham). Easter Sunday Worship (10:30 am) is a wonderful celebration with flowers and brass. There will be a lunch following the service… Let’s Do Lunch! Maundy Thursday to Good Friday Fast? Are you interested? It’s optional… but feel free to Download the guide here! Or if you have any trouble receiving it, email Peter pma535 [at] gmail.com. Thank you for your generous donations of over $1000. We have prepared baskets for local families in need, to bless them this Easter! As part of the Markham Music Festival, the Evangelism and Outreach Committee is once again having a used book sale. We will be collecting and sorting books during the last two weeks of May, so you have until then to start collecting novels you have already read and memorized, coffee table books, cook books that have given all of their delicious recipes etc. Hard cover, soft cover we would appreciate them all. 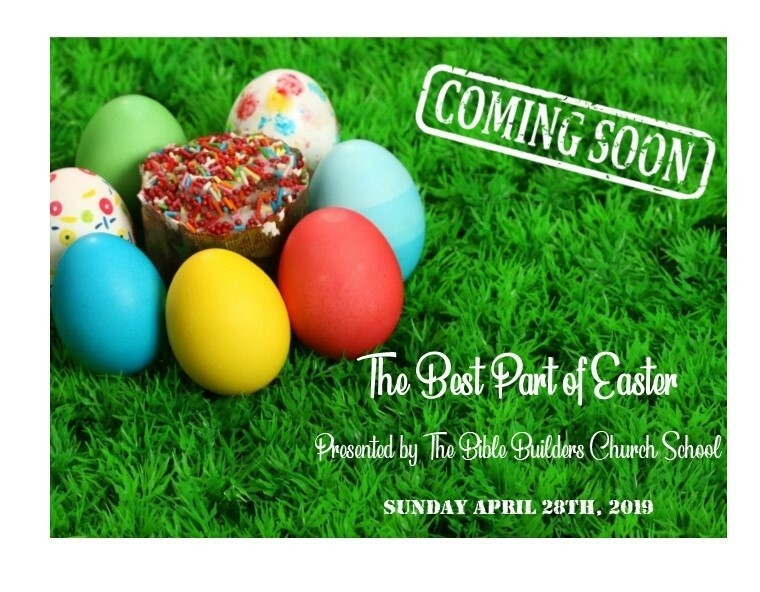 Our booth will also help promote programs in the Church including Messy Church, the Vacation Bible School, as well as others. Proceeds from the sale would be used to offset the cost of our Evangel Hall Dinners. Please note that the next sandwich delivery will be Wednesday April 24, 2019. Thanks to Cate Bokhout for her delivery to Evangel Hall on Wed March 27. Thanks to everyone who made sandwiches. They will make a difference in the lives of people who need it most. The next Evangel Hall Dinner will be on May 26, 2019. The last Sunday of each month (this Sunday) is designated as Food Bank Sunday. Bring non-perishable items to support people in need! Most needed food items include: Sardines, Hot cereal, Cold cereal, Pasta sauce, Crackers, Baby food, Baby Formula and Rice. 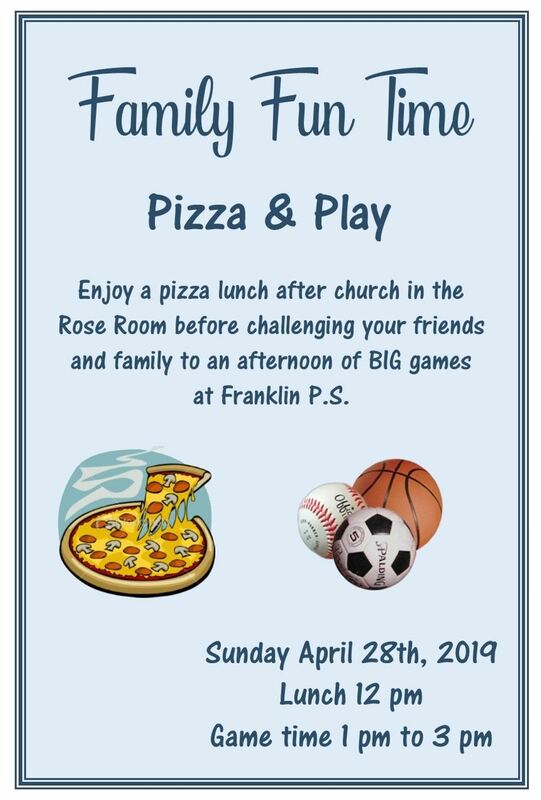 be held on Tuesday, April 23rd. Visitation at 1:00 p.m. and the service will commence at 2:00 p.m. Reception to follow in Fellowship Hall. We would like to thank our fellow members and friends at St. Andrew’s for their many thoughtful cards, phone calls, gifts and prayers for Jane while recovering from heart surgery. Jane is back and her recovery is going very well. 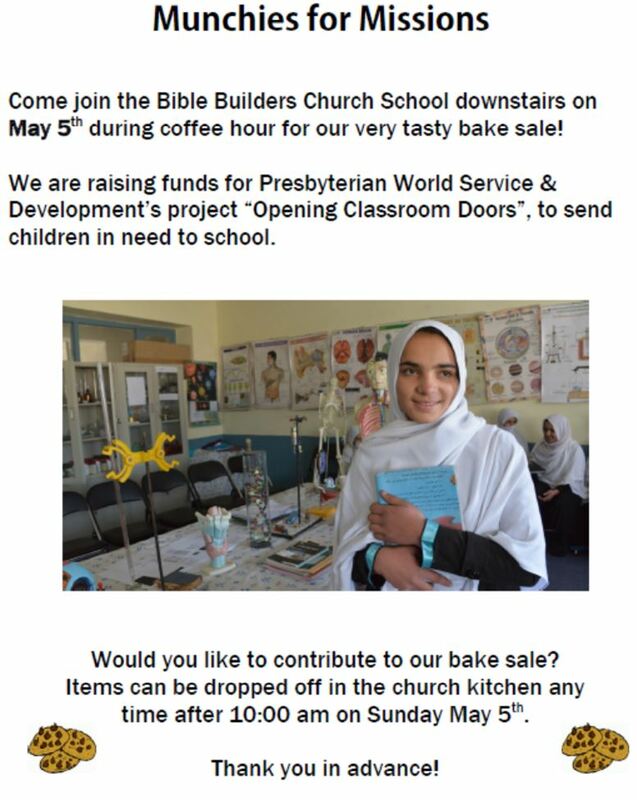 Be a part of the Bible Builder’s Church School Mother’s Day Presentation. Submit a photo of you and your mother or a photo of you and a significant “Mother-like” person in your life. The photos will become a part of our Mother’s Day photo collage displayed on Sunday May 12th. Please submit your picture by Sunday, May 5th. Photos can be emailed to Lynne at lynne.lidkea [at] gmail.com. If you do not have a digital photo you may give your picture to Lynne or leave in the church office. Kindly, write your name on the photo so that we can return it to you after scanning. 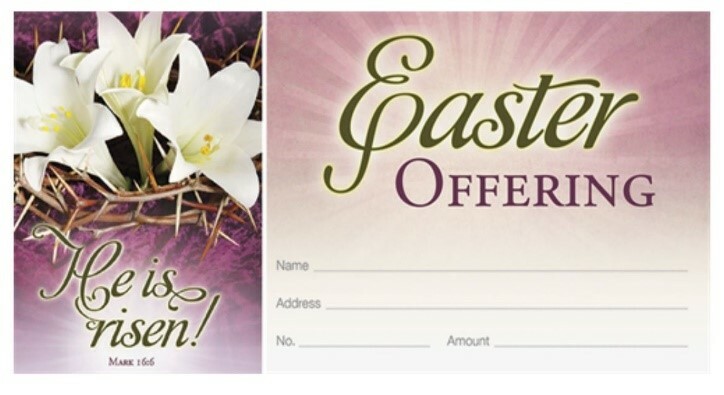 This Easter, we invite you, as an opportunity not an obligation, to support our Kirk Session Fund. This fund allows our elders to support outreach, administration and start-up programs. For example, in the past we have used our Session Fund to pay for Sunday coffee supplies, police checks for our leaders, and seed money for our Transportation Committee. These are items outside of our church’s annual budget. We thank you for considering this gift at Easter. If you do give, we ask that it be over and above your regular offerings and tithes. Please put either your name and address or envelope number in order to receive a tax receipt. Betty Taylor will be leading a study called “Meeting the Spirit”. Who is the Holy Spirit? How does he change our lives? “The New Testament You Never Knew” by N.T. Wright and Michael F. Bird. New members most welcome. Join us for this video and discussion session. For further information contact Isabel Cole. Join us for our video and discussion session on “Jesus the New Way” by N. T Wright. 1. 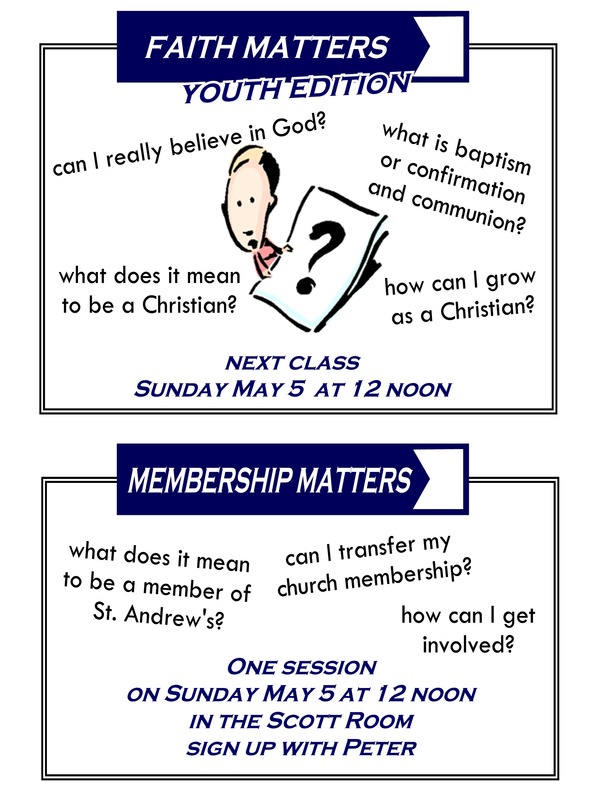 Our worship service on Sunday is at both 9am and 10:30 am. 2. We offer nursery care starting at 10:30 am. 3. Our Bible Builders Church School program at the 10:30 am service, includes the following classes: (Nursery 0-3 yrs, SK-Gr. 3, Gr. 4-6, Gr. 7-12). Come as a family to worship and we’ll send the kids out after the youth message. 4. We have a wireless sound system for anyone who has difficulty hearing. You can get a set of headphones from the sound desk at the rear of the church. 6. If you would like to donate non-perishable food items for the Markham Food Bank, please place them in the white baskets in the narthex (front entrance). We designate the last Sunday of the month as Food Bank Sunday. 7. Sign up in the narthex to make a loaf of sandwiches for Evangel Hall. Sandwiches are delivered on the 4th Wed of each month.